Amazon workers protest Black Friday in the UK. Amazon employees across parts of Europe are striking and protesting what they describe as dangerous work conditions and anti-union tactics. The protests coincide with Black Friday, one of the busiest and most stressful days of the year for workers in retail. 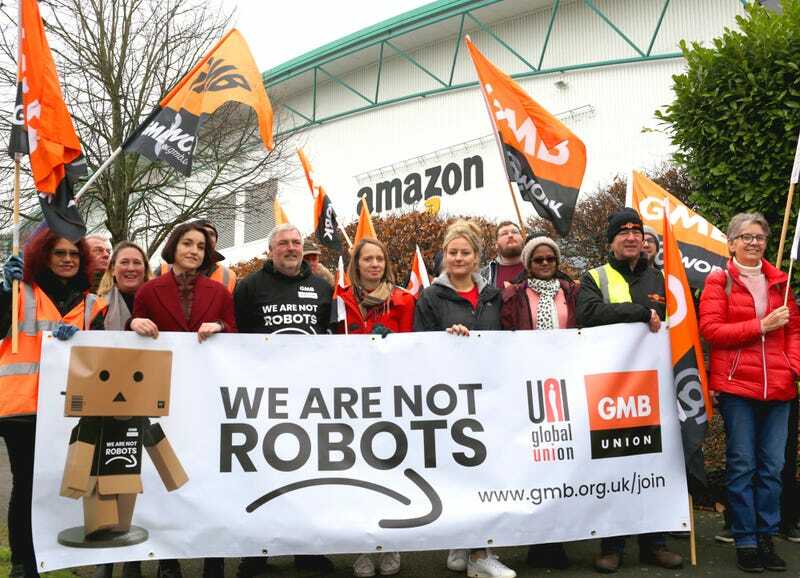 Amazon employees in the UK, Germany, Italy, and Spain participated in the strike. Workers cited comparatively low pay, hazardous work environments, and unreasonable performance expectations as among their reasons for protesting. Andreja Schmidtkunz, a German Amazon worker and member of the union ver.di, said in a statement that some workers had undergone multiple surgeries after joining the company. Schmidtkunz added: “You start at the company healthy and leave it as a broken human.” Several employees also described experiencing physical pain or injury on the job. Eduardo Hernandez protests at a facility outside Madrid. Francisco Hervias, another Amazon worker protesting at the same facility, said he was injured and nearly lost his hand on the job. Both Hernandez and Hervias were organizing with Spanish union CCOO. A spokesperson for UNI Global Union, an international entity that works to build alliances between unions that represent Amazon workers, told Gizmodo by email that 2,600 workers were on strike in Europe, adding that more are protesting. While the protesters hoped the walkout would disrupt the company’s bottom line and call attention to their demands for higher pay and better work conditions, an Amazon spokesperson told Gizmodo the protests had not had any significant impact on the e-commerce behemoth on Friday, adding that it was “business as usual” at its fulfillment centers. The company also took issue with claims that it underpaid its workers and disputed accusations about poor work environments. A protester in Spain wears a Jeff Bezos mask. Workers have raised concerns about unfair pay and poor working conditions at the company for years, with some claiming in the past they’ve even had to skip bathroom breaks to keep their jobs and were pressured not to report injuries. Amazon also has a track record of being anti-union, a position that Christy Hoffman, the General Secretary of UNI Global Union, said in a statement was both “dangerous” and a violation of workers’ rights.